If you are like me, then you are constantly looking for a new and easy ways to prepare chicken for dinner. 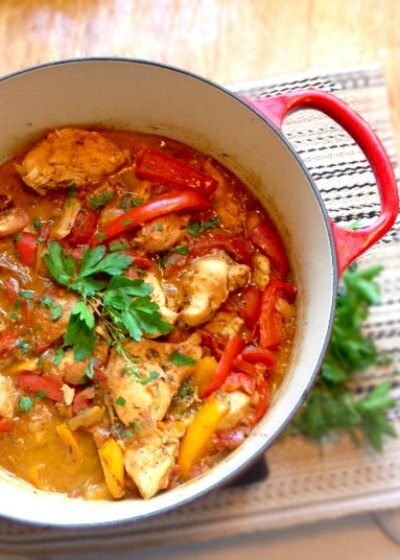 This one-pot Chicken Stew with Peppers and Tomatoes recipe is actually a classic staple from the Southwest region of France known as Pays Basque. Known in France as Poulet Basquaise which translates to “Basque Chicken.” In this Chicken Stew with Peppers and Tomatoes recipe, I have replaced the cured ham with bacon which adds a wonderful flavor to this stew. While traditionally stewed in a Dutch oven on the stove, I have also adapted this recipe for slow cooker instructions. Perfect for a weeknight meal or a Sunday supper. Basque cooking traditions are unique compared with typical French cuisine. The people of Basque prepare Poulet Basquaise by stewing chicken in a piperade (consisting of onions, tomatoes, red bell peppers, Piment d’ Espelette, cured ham, wine, and fresh herbs that have been sauteed together) until the chicken is fall-apart tender and full of flavor. Piperade is a versatile flavoring and the Basque people are known for using a piperade base on most of their meals serving with eggs, meats, rice, or potatoes. Piment d’Espelette is a mild hot chile pepper which is a key ingredient in piperade. This chile pepper is only grown in the Basque region of France and become popular to use as an integral flavoring in Basque cooking. Check out this Spicy Grilled Ahi Tuna with Vegetables on Ciabatta Bread Recipe that also uses this unusual and delicious Piment d”Espellette spice. Find more of our best top-rated Chicken Recipes. Enjoy more Slow Cooker Recipes. Piment d’ Espelette is a red chili powder from the Basque region of France and Spain and named after the village of Espelette in France’s Nive Valley. It can be found in powdered or paste form. Piment d’Espelette was introduced to France from Central and South America during the 16th century. It was first used for medical treatments and later become a popular flavoring in Basque cooking and helped conserve meat and ham. In the Basque region, Piment d’Espelette is more commonly used for flavoring foods than black pepper. This unique pepper is harvested in late summer. Then in October, an annual pepper festival is held which attracts thousands of tourists for the event. * Substitute drumsticks and thighs for more traditional French stew. ** See step-by-step photo tutorial on how to peel fresh tomatoes. Or substitute 1 (4-ounce) can of crushed tomatoes. *** Can substitute 1 teaspoon dried thyme. **** Can substitute regular paprika. Note: Piment d’Espelette is difficult to find in US stores. The best bet is to order online through Amazon (Piment d'Espelette) or substitute with a hot paprika to come close to the flavor. Sprinkle chicken with salt and pepper; set aside. In a large 5 to 6 quart Dutch oven, over medium-high heat, add 2 tablespoons of olive oil. Add chicken and cook for 8 to 10 minutes and let brown on all sides. Remove chicken from Dutch oven and set aside. Add bacon pieces to Dutch oven and cook until browned. Drain off the excess bacon fat, leaving just enough to cover the bottom of the Dutch oven. Next add onion and garlic and sauté for a few minutes until the onions are translucent. Add the white wine and use a spatula to (deglaze) scrape the loose bits from the bottom on the pan. Add the tomatoes, bell peppers, thyme, parsley, hot paprika, and chicken bouillon. Stir together and then add the browned chicken to the Dutch oven. Bring just to a boil and turn heat down to medium-low. Cover with a lid and let simmer until the chicken is cooked through for approximately 30 minutes. Add salt to taste and serve. This stew is excellent served over hot rice or noodles with some crusty bread. Add chicken breasts to slow cooker and sprinkle with salt and pepper; set aside. In a large skillet over medium-high heat, add bacon pieces and cook until browned. Drain off the excess bacon fat, leaving just enough to cover the bottom of the skillet. Next, add onion and garlic and sauté for a few minutes until the onions are translucent. Add the white wine and use a spatula to (deglaze) scrape the loose bits from the bottom on the pan. Add the tomatoes, bell peppers, thyme, parsley, hot paprika, and chicken bouillon. Stir everything together and let the mixture come just to a boil. As soon as it starts to boil, remove from the heat and pour over the top of the chicken in the slow cooker. Cover with a lid and cook on high heat for 4 to 5 hours or low heat for 8 to 10 hours until the chicken is fall apart tender. Adjust with salt to taste and serve. Sounds great Linda, I will definitely give this a try. I have a new CrockPot which has an insert I can use on the stove for the usual initial step of browning, and I am loving it. So easy to do slow cooker recipes.